A police commissioner has said he plans to apply for "special funding" to cover the cost of policing the royal wedding. Anthony Stansfeld said they could claim for cash from the Home Office if the bill comes to over 1% of the Thames Valley force's £405m annual budget. 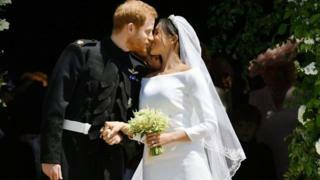 He admitted it would take "a long time" to finalise the exact cost of Duke and Duchess of Sussex's big day, but suggested it was "between £2m and £4m". He said having to "carry" a bill of up to £4m was "not entirely satisfactory". The police and crime commissioner (PCC) told the BBC the cost was currently "well below" the £4m required to make a claim. However, he said the costs of "other major national events" coming up in the force's area this year could be merged to get funding from the special grant. The Home Office says PCCs can apply for special grant funding to meet additional costs that would be incurred from "policing unexpected and exceptional events within their areas". Policing minister Nick Hurd said no application for funding in respect of the wedding had so far been received. "The cost really was a lot of people [officers] had their leave cancelled and will take it at other times," Mr Stansfeld said. "Those sorts of things, there is not a direct cost but there were direct costs." The wedding saw crowds in excess of 100,000 people. The Metropolitan Police spent £6.35m on security for the Duke and Duchess of Cambridge's wedding in 2011. Royal Ascot, Henley Regatta and the wedding of Princess Eugenie to Jack Brooksbank in St George's Chapel at Windsor Castle are some of the events that will be policed by Thames Valley Police this year. Royal wedding 2018: Who's paying? Bill Barr says 10 "episodes" involving President Trump were scrutinised for possible obstruction of justice. What next after Mueller report lands?